A strange Pyramid with a strange name Ha! Ha! (Fr. "Pyramide des Ha! Ha!") is located in the La Baie, borough of Saguenay, Quebec, Canada. The Pyramid was erected in memory of the flash floods in the Ha! Ha! River, that hit the region on July 19 and 20, 1996. It was reportedly the biggest flood in 20th century Canadian history and caused severe damage to area. It was estimated that the floods destroyed 488 homes and damaged 1,230 homes. It resulted in death of 10 persons and a financial damage and cost of reconstruction of about US $1.4 billions. 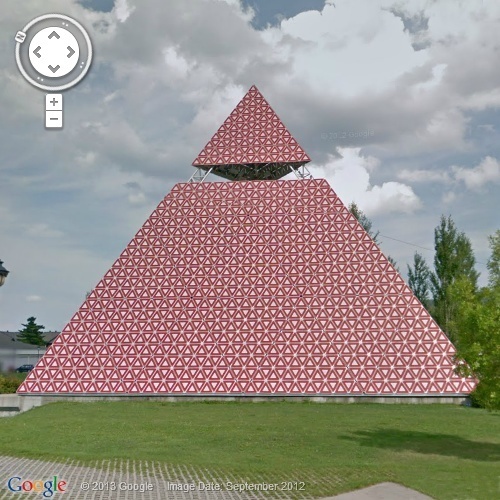 The 21 metres (70 ft.) high Pyramid, inaugurated in 2000, is made of 3,000 red and white triangular "Yield" traffic signs made from aluminium and affixed to aluminium structure. Its top portion has a viewing platform giving a panoramic view of the river which had caused almost total destruction of the area. The platform is accessed by a staircase inside the Pyramid. The red of the "Yield" sign has fluorescent film which glows in the night. Image from Wikimedia Commons is by Adqproductions and is used under CC.